....more to come from Pernel & Aaron's vintage inspired lemon and lace wedding. I love that second photo! Reminds me of something I would see at Anthropologie. Can't wait to see more from this wedding. wow. 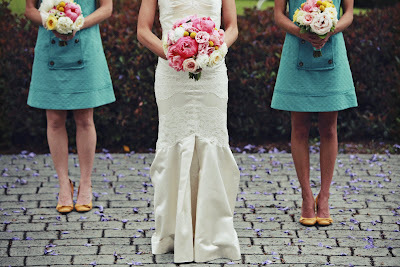 that bouquet looks exactly like the one on my blog today which I've been loving. Can NOT wait to see the rest of this - love it so far!! Ok. Just realized it is the same couple!! Small world :) Loved their wedding and can't wait to see all the details you came up with! I can't wait to see! Heather- You put together some serously amazing events! Awesome wedding AND Love the new look of the blog. Heather, you are so amazing. Everything you involve yourself in is magnificent! oh wow, I can't wait to see more! 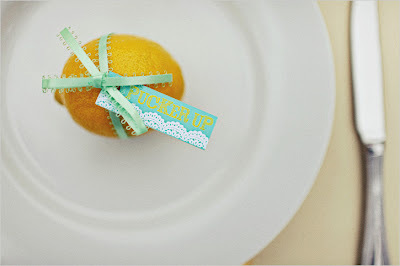 I love the little lemon tags, and those bridesmaids dresses look adorable!